The 2017 Honda CRF450R has been arguably the most talked about and highly anticipated motocross bike uncovered in recent history. With a release date around three months later than usual, interest and suspense for the new Honda has peaked lately. 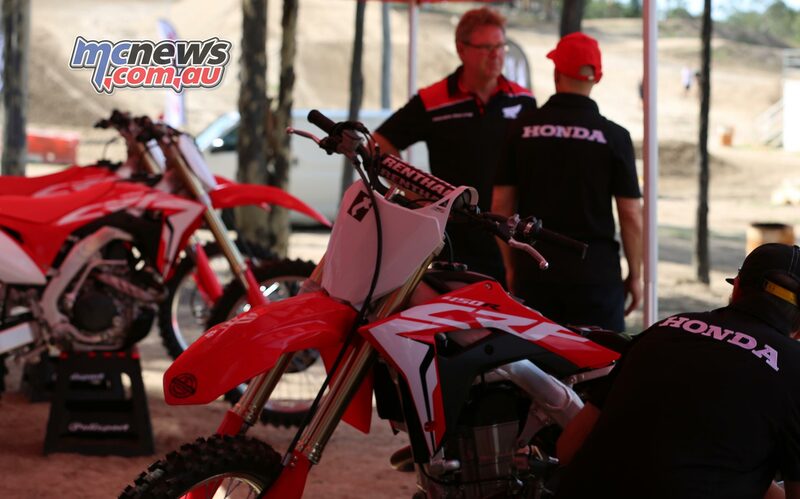 Just have a look at the number of CRF450R’s that have been preordered this season and you’ll get an understanding of the kind of demand Honda are dealing with. So, what caused all of this anticipation and hype? 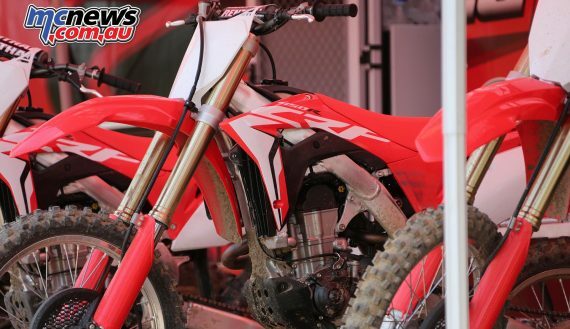 The first spy photos of Akira Narita’s factory Honda CRF450RW that surfaced earlier this year may have been one of the culprits. Why? 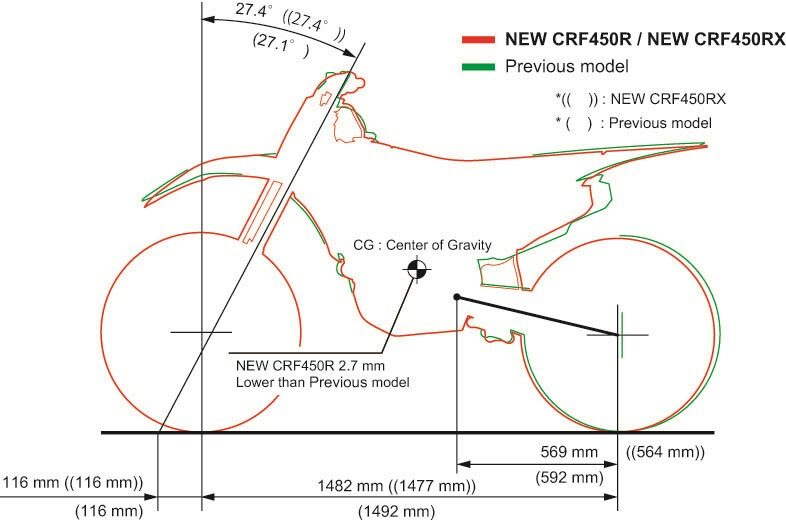 Because Narita’s CRF450RW in the All Japan Motocross Championships typically forms the basis for Honda’s production model bike the following season, and Narita’s bike this year was radically different to anything the motorcycling industry have seen from Honda in the past few seasons. 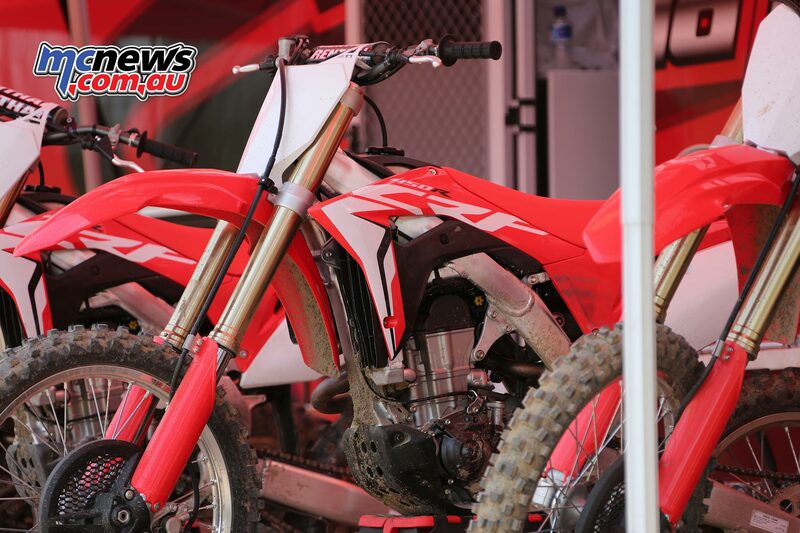 Another factor was that all of the questions surrounding how similar Narita’s factory machine would be to the production model, remained unanswered throughout the majority of the season. As a result, the longer the public were kept guessing, the more the anticipation built. 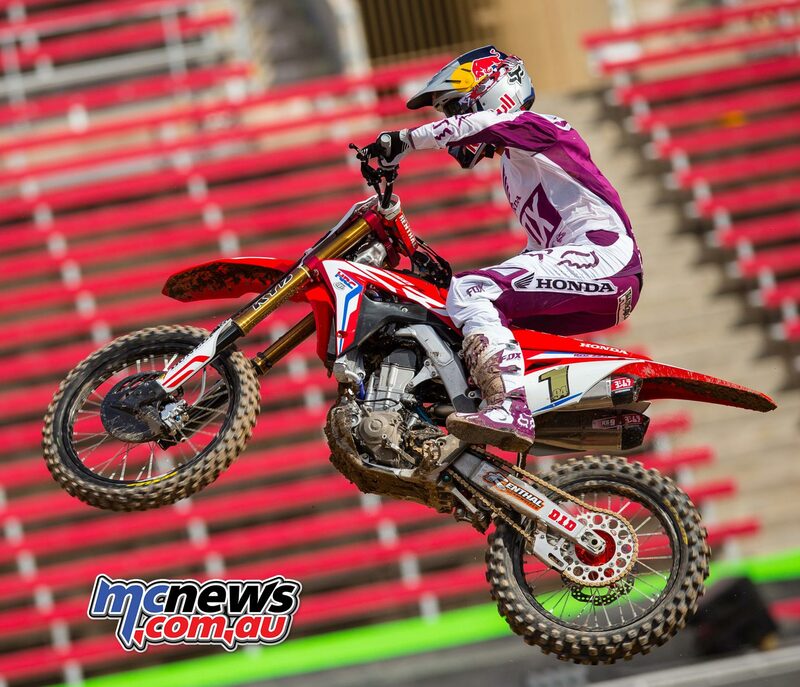 Then there was the early whispers and eventual confirmation of Ken Roczen’s move to the Honda corporation, which for most was a sign that Honda were investing largely into the new bike and were confident with what it could produce for the planet’s most sought after rider. 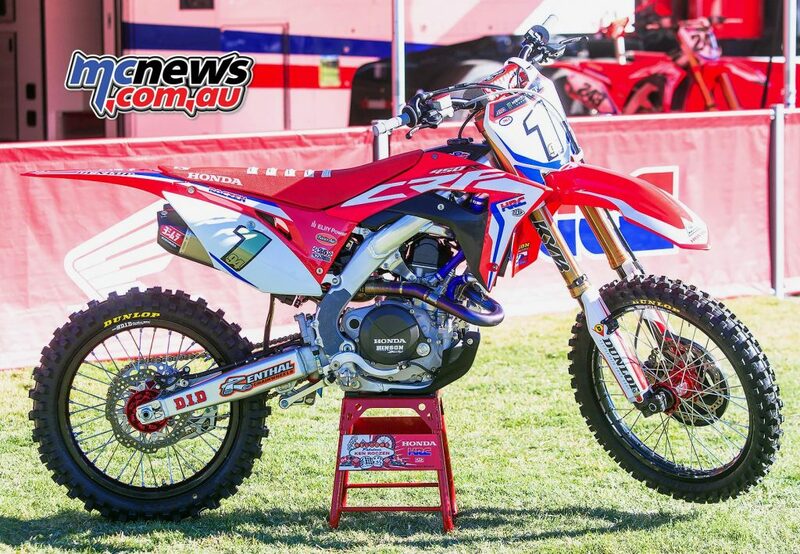 Add to this, Honda keeping on Cole Seely in the AMA series, retaining the number one plate holder Tim Gasjer in MXGP, and domestically bringing on board Todd Waters and Luke Clout for 2017, and it looks as though Honda have built their teams globally with one goal in mind – to claim every major motocross and supercross championship possible. Generally, companies invest in products that they’re confident in, so if this rider line up is anything to go by, Honda are most definitely poised with their R&D and end product. The excitement around the new machine has built even more so since Ken Roczen’s first competitive appearance aboard the 2017 CRF450R at the Monster Energy Cup, where he dominated and went on to an almost perfect performance. Could we see these kinds of performances all year from the young German? 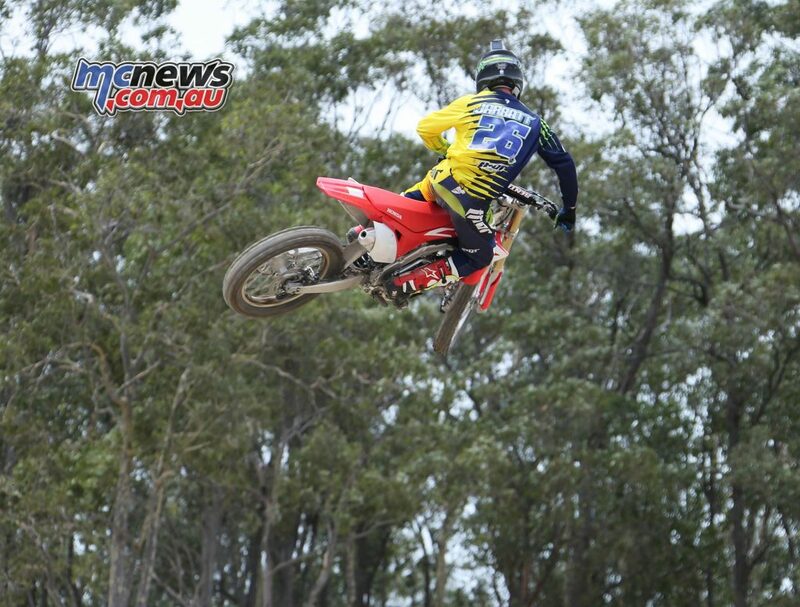 Now that we’ve acknowledged the publicity and excitement surrounding the 2017 machine, what’s actually new on the bike? Well… Just about everything to be honest. 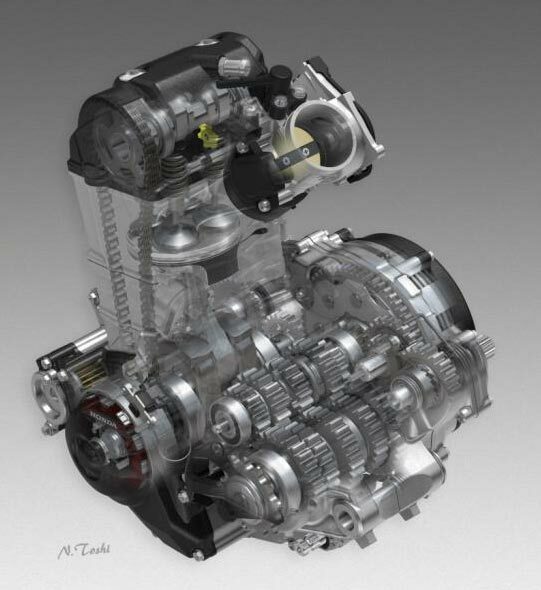 From a redesigned frame, to the return of spring forks, a remodeled engine, new exhaust system, lighter weight titanium fuel tank, shorter swing arm, lowered centre of gravity, redesigned and hugely improved air intake, updated valve angle and piston shape, significantly increased torque and horsepower, redirected rear-end load, remodeled clutch system, updated engine mode switch housing, and slimmer, redesigned plastics and graphics. Now that we’ve finally had our hands on the 2017 model, what did we think of it? Let’s just say each paragraph below is worth the read. 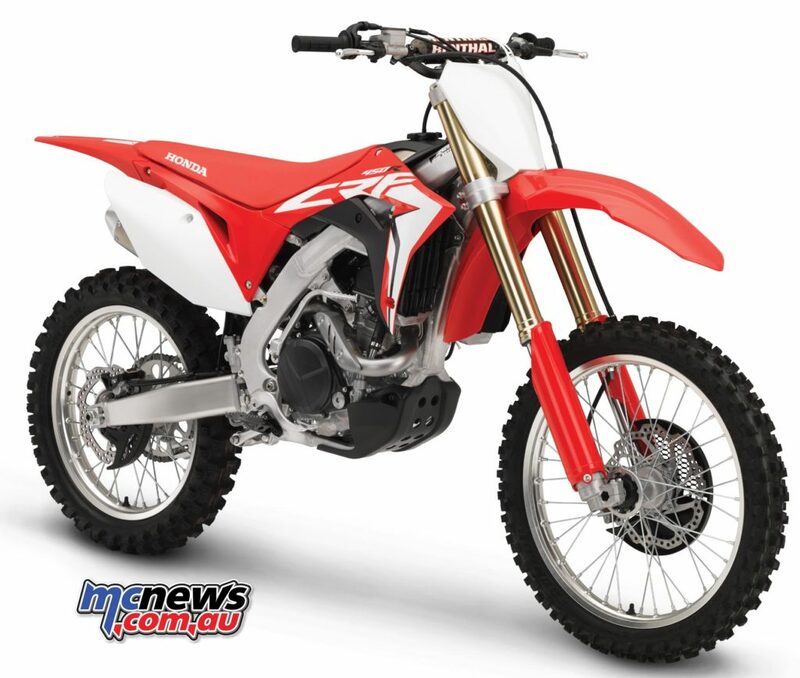 As mentioned briefly above, the new 450 features completely redesigned main and sub frames. The main frame is a far more efficient design with less unnecessary protrusions, which has saved 280 grams of weight. Pair this with the new upmarket titanium fuel tank, which is 513 grams lighter than the previous plastic componentry, and you’ve already wiped away over three quarters of a kilo. 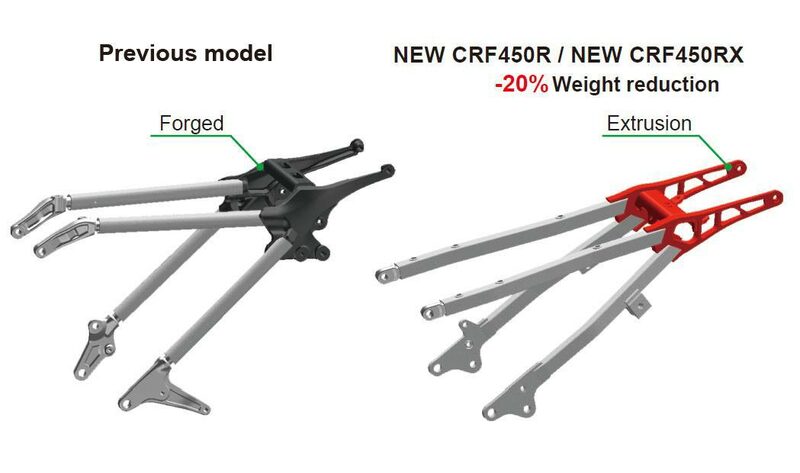 But they’re not the only weight saving changes made… The sub frame has had its mounting positions altered, which means the bilateral cage is much neater and has also delivered a 20% decrease in weight from the previous model, bringing the weight reduction closer to the kilogram mark. These frame alterations have been met with a 23mm reduction in swing arm length, which has played a major role in not only shortening the 2017’s wheelbase by 10mm, but also by linking with the dropped rear cushion it has assisted in lowering the bike’s overall centre of gravity by 2.7mm. These frame updates have improved the bike out of sight and will be very popular amongst the public, as the bike now feels more compact and controllable when in the saddle. The bike doesn’t sit too tall or wide and actually feels very light and slim around the cockpit. 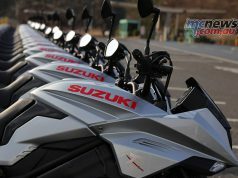 I noticed I had far more control over the bike and could steer with the rear-end more than previous models, which from other reviews you know is a big preference of mine. This may also have been due to the increased load now being allocated to the rear-end through the chassis adjustment and updated rear shock positioning. These changes have led to more traction being available to the rear wheel and that I can guarantee was immediately noticeable. 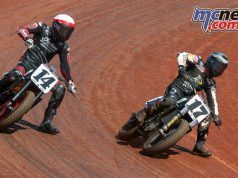 The rear of the bike settles and tracks so well not only in deep ruts, but also on the more square-edge, hard-packed parts of the track, which really boosts your confidence while riding. I should also note that surprisingly, with this increased load being allocated to the rear-end, the front-end stability has not been sacrificed – which I initially thought would be a major concern for 2017. As a result, I am confident in saying that Honda have absolutely nailed their chassis for 2017 – lightweight, slim, balanced, and very throttle friendly. 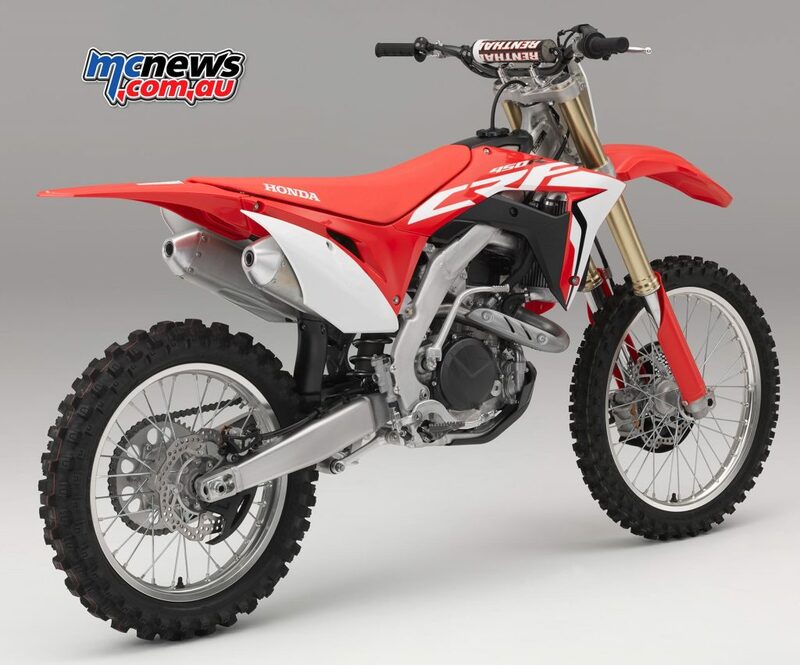 After a few years of dabbling in the air fork department, Honda have redirected their production model CRF450R to the traditional spring fork setup. To be specific, the forks utilised are a 49mm Showa Spring fork featuring 39mm and 25mm compression and main piston diameters respectively. The spring forks are matched with the Showa rear shock and overall combined to be a faultless package during our time on the bike. As mentioned previously, with the rear cushion being lowered and more load being directed to the rear-end for the purpose of increasing acceleration, I was expecting the front-end handling to be heavily compromised. I was however, pleasantly surprised to find that the front-end maintained, if not improved its handling characteristics from 2016. We started initial testing with 100m of rider sag, standard fork and shock clicker settings, and the forks just pulled through the clamps (toward the bars) 3mm more than standard. This setting was fine for the first half and hour or so while growing accustom to the bike and its general characteristics, but as I got more comfortable and pushed the bike a little harder I found the front-end was diving a little too much for my liking while under brakes and landing off some of the bigger step ups at Ranch MX. So, I made a quick pit-stop to push the forks through 3mm (back to the standard setting line) and went out for more testing. 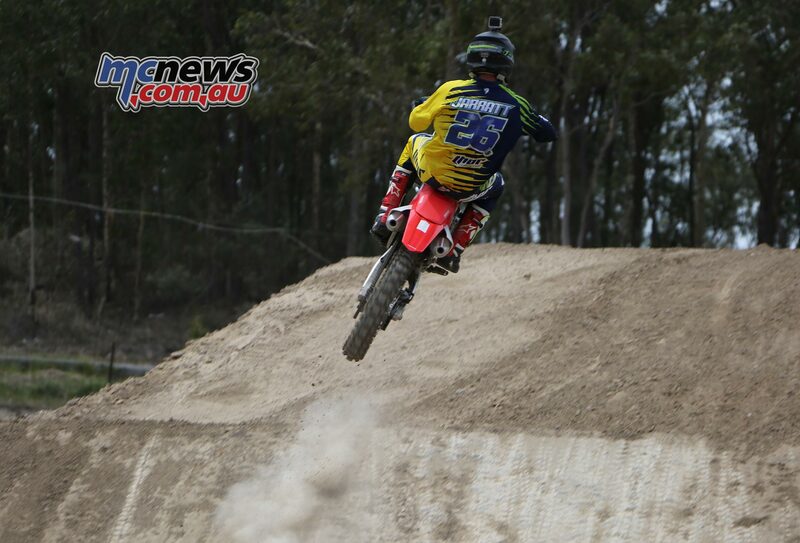 This change was just what I needed at that point, as it leveled the bike out and minimised the diving sensation I initially felt. After another 15-20 minutes on the bike, I found that again the front-end was dropping a little too much for comfort, so this time around we went two clicks stiffer on the fork compression damping and two clicks softer on the shock’s high speed adjustment – in an effort to move more of the load to the rear of the bike. Voilá – this was my setting for the rest of the day, and a setting I dare say I’d make very few changes to if it was my own personal bike. 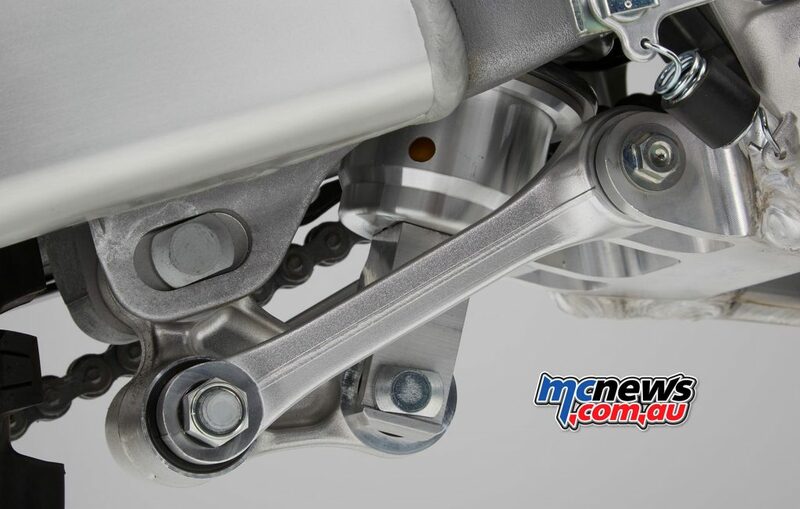 Obviously, suspension setup is completely specific to rider ability, weight and preference, but I think the production Showa package will suit the majority of riders in dead-stock trim, so in that sense Honda have been able to tick another box. The most heavily updated area of the 2017 model, fittingly is the engine department. I say fittingly because in recent years the Honda’s overall power has been where it’s lost marks to opposing manufacturers. For 2017 though, Honda have come back with a big bite and created an engine package that very quickly silenced my previous opinion of the bike lacking power. 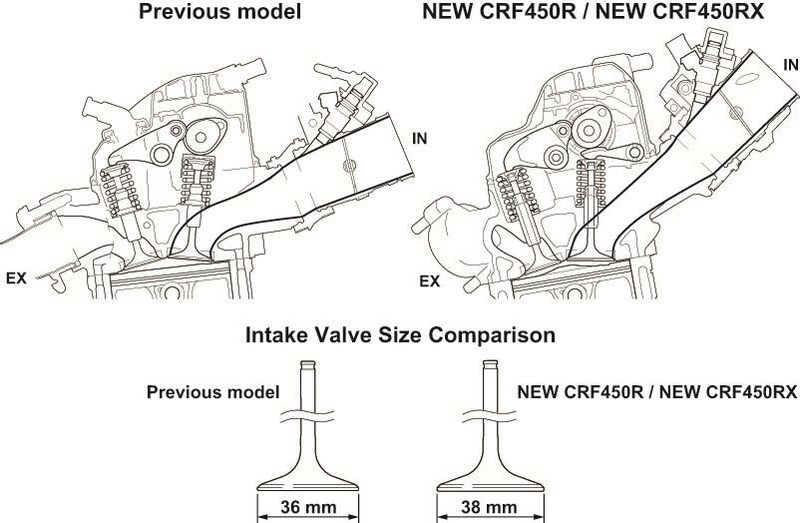 With revised intake and exhaust ports, as well as 2° narrowed valve angles, Honda have created a flatter, smaller surface area combustion chamber, straighter air intake passage and 2mm wider intake valve, which has helped increase the compression ratio from 12.5 to 13.5 and also largely improved the overall charging efficiency (fuel to air mixture). 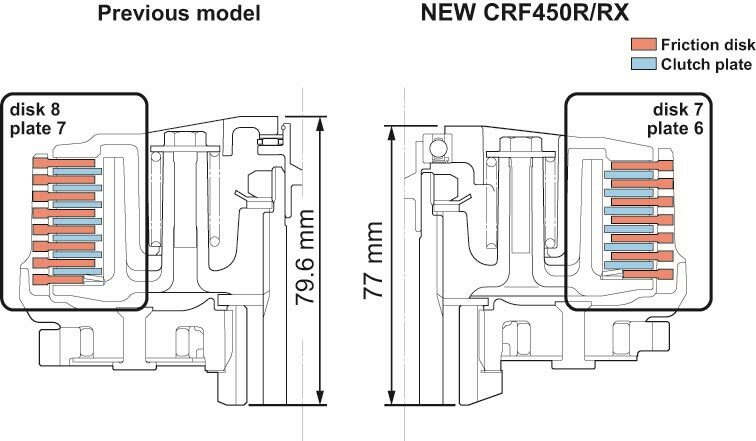 A revised piston, as well as the addition of finger follower rocker arms and oval shaped valve springs also add to the new generation “Unicam” engine. These features as a whole have improved combustion efficiency and increased valve lift while limiting overall engine height, and as a result have led to a noticeable improvement in power output, acceleration and torque. 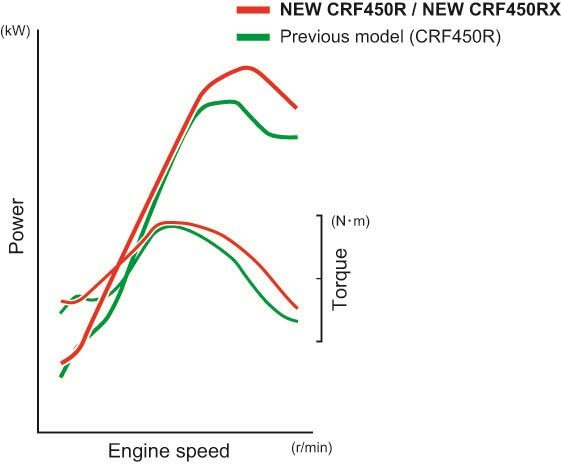 Now, this quoted “noticeable improvement to power output, acceleration and torque” isn’t just a typical statement, the difference between the engines of the 2016 and 2017 CRF450R’s is night and day. Aboard the latest model, I was literally able to run fourth gear without a problem at the Ranch in turns I would typically need to run second in. The engine for Honda in 2017 is by far their greatest improvement and also in my eyes now they’re greatest asset – that’s saying something about the new package. 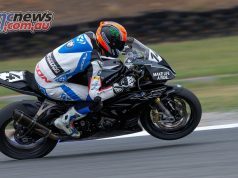 In previous reviews, I have also harped on about how I prefer a lot of bottom end “punch” or torque from a bike, as I tend to run higher gears and lower revs when riding. The Honda allowed me to do just this, and in being completely honest, it was the most comprehensive engine package I have ever ridden. I was in love with the power delivery, from unbelievable bottom end power all the way through the mid-range and right up toward the pointy end of the RPMs. Even when completing laps purposefully using lower gears and higher revs, I found that the bike didn’t seem to sign off much when I neared the end rev range – which highlighted to me just how broad the power delivery was. A few other specs to be mentioned for 2017 include the 78mm shorter exhaust system, advanced oil scavenge pump, lower volume and subsequent lighter weight oil system (1,390ml down to 1,250ml), diamond-like carbon (DLC) coated inlet valve finger rocker arm and piston pin, reduced clutch system size, updated ignition timing switch housing, and optional electric start system. 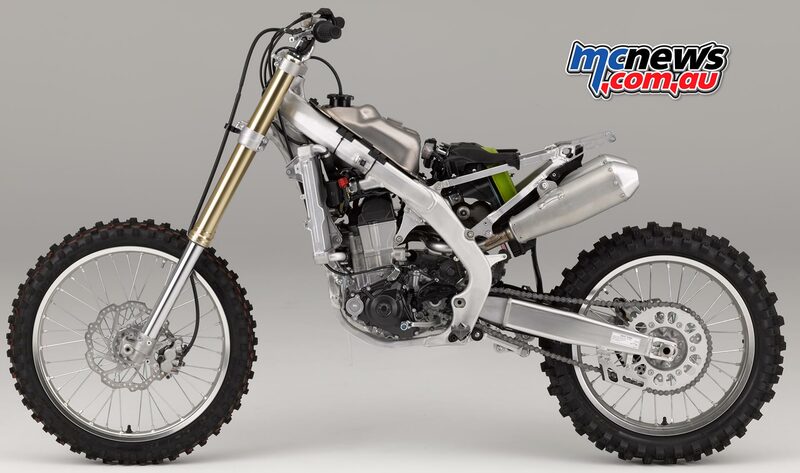 The shorter exhaust system adds to the mass centralisation focus of the new bike, while the updated scavenge pump and oil system improve internal lubrication and the DLC coated finger rocker arm and piston pin decrease general wear and tear. In addition, by decreasing the number of clutch discs and plates from eight to seven, and seven to six respectively, Honda have been able to decrease the clutch system size to maintain a lightweight feel while partnered with a more powerful engine – win, win. The final major updated feature to be mentioned regarding the engine compartment is the ignition map switch housing. Previously found on the right side of the handlebar, for 2017 Honda have combined the three-mode switch with the engine stop button on the left side of the handlebar – this saves weight and seems more logical to me. The ignition map options available are; mode one (standard), mode two (smooth), and mode three (aggressive), which can be interchanged at any time while the bike is running and throttle is off. My pick of the ignition maps was mode three (aggressive), but again I am more inclined to prefer this map due to the fact that it simply suits my style of riding. 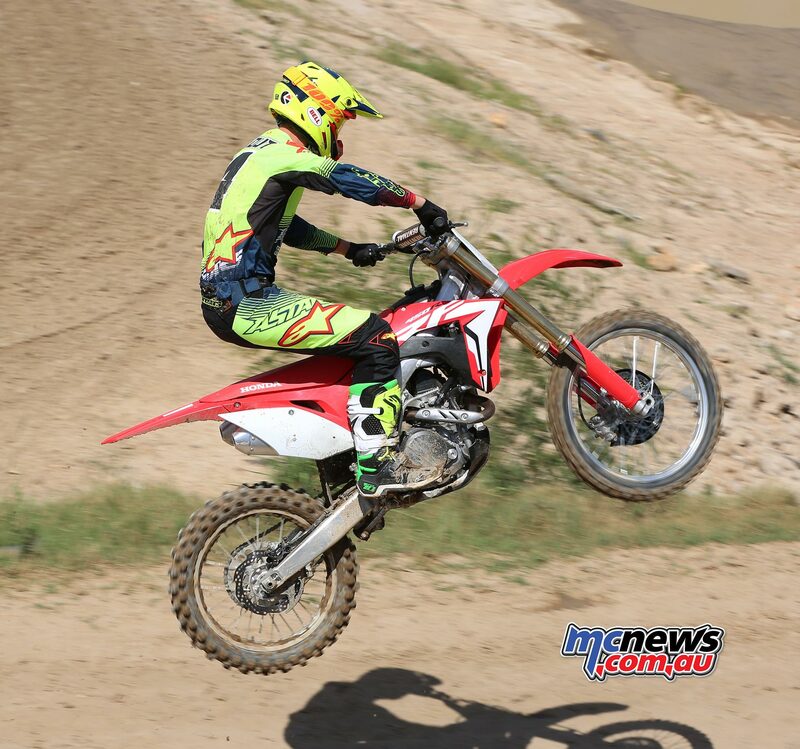 I think for most riding the new CRF, mode one (standard) will fit the bill perfectly as it still provides plenty of power, but doesn’t want to rip your shoulders out of the socket. In fact, I noted that Honda’s own Luke Clout preferred mode one, so it is obvious that the choice is completely down to personal preference and track condition. 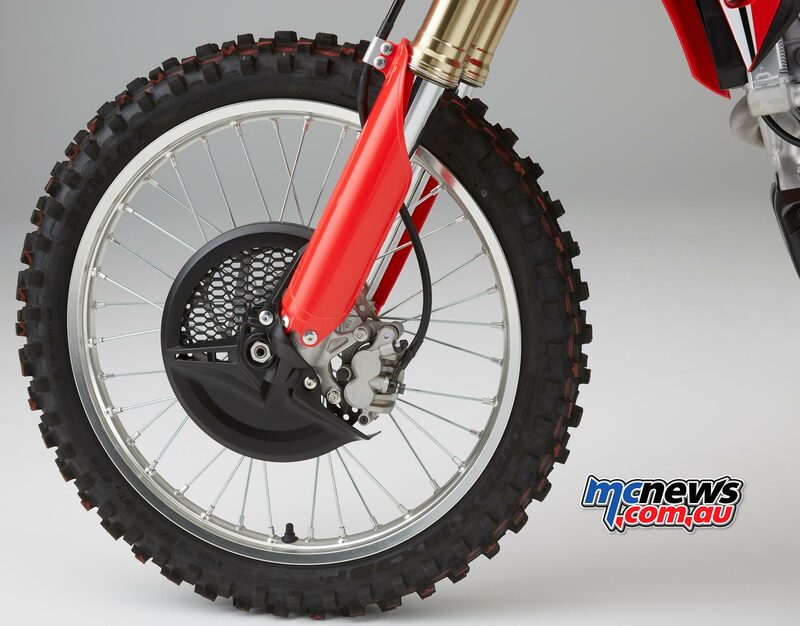 One of the only aspects unchanged for 2017 is that of the braking system for the CRF450R. A 260mm wave front disc and two-piston brake caliper is still being paired with a slightly smaller 240mm wave disc and single-piston caliper for the rear. Although I didn’t have any issues with the stopping ability of the new Honda, I still feel it would be nice to see more production model bikes coming out with 270mm front brake discs, as one of the first upgrades consumers make to their new bikes is to upsize their front disc. In 2017, Honda are still offering their “extreme red” graphic, but the bike now features film insert moldings and black textured surface on the tank shroud. This basically means that the graphic on the tank shroud is now printed into the plastic and that there is a rough, grippy surface on the black adjoining plastic of the tank shroud. I will also note that the 2017 tank shrouds are 30mm slimmer and more seamless than years passed, meaning the cockpit doesn’t feel and wide and you no longer have the issue of catching your boots and pant legs on the front of the plastic. Pair these styling updates with a black front brake disc cover and skid plate, as well as red fork guards, seat, rear fender and air box, and you have one mighty fine looking machine straight off the showroom floor. I’ll be completely transparent in saying that over the past few years I haven’t really viewed the Honda as a class-leading bike. It wasn’t my pick of the bunch from 2014 to 2016, but now that I’ve ridden the long-awaited 2017 model, my mindset has completely reversed. The extensive R&D that has gone into this bike has most definitely paid off, and I honestly believe it is the best motorcycle I’ve ever ridden. In my eyes, it achieved either a 9 or 10 out of 10 in every major department, which is an impressive feat. So, if I was in the market for a new open class machine for 2017, I’d be hard pressed to find anything that could top the CRF450R. They were right… Believe the hype.